If you have any questions or suggestions you are welcome to join our forum discussion about Scalping Minor reversals in Trading Ranges. When the market is not displaying trending behavior, rather moving sideways, it provides experienced traders with the opportunity to counter-scalp each new swing high and swing low. We’ve previously advised novice traders to refrain from counter-trend positioning and also avoid entering the market during trading ranges, especially the most dangerous of them all – the “barbed wire” pattern. 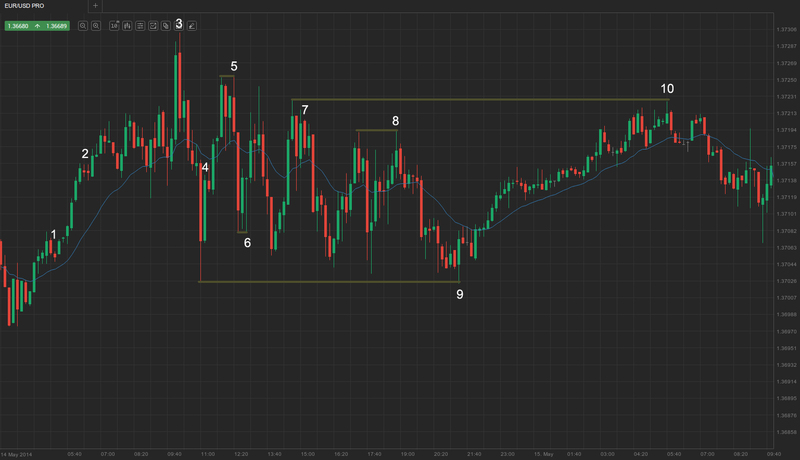 However, some trading ranges allow for the usage of a fairly successful scalping technique – counter-betting swing highs and lows, and occasionally offer some reasonable swings as well. The most reliable of these minor reversals within the trading range are wedges at new extremes and second entries. The problem with scalping is you need to have a very high rate of success in order to be consistently profitable, if you are a full-time scalper. In contrast, if you are a swing trader (which is what every novice trader should aim for), you are focusing on scalping a portion and swinging the other portion of your position during strong trends, and may only occasionally scalp a profitable entry during a trading range. Even though it is harder to benefit from a trading range, if you see a high-probability scenario for even a minor profit in a trading range, why shouldn’t you scalp that? On the screenshot below you can see a fairly wide trading range, which provided traders with several reliable entry signals. The market broke out of a tight trading range and traders could have either entered long above the first bar which closed outside the range, or above the bar 1 pullback. The breakout out of the trading range warranted a strong, probably two-legged up move, before momentum wanes, so some traders who had previously gone long scaled in at bar 1. The scaling in plus new longs pushed the market further up and some players took profits, which caused a small pullback at bar 2 and stalling momentum. The market entered a narrow trading range between bars 2 and 3, closely resembling a “barbed wire”, which was followed by a strong upward breakout to a new session high. However, the previous robust balance between bulls and bears hinted sideways trading might continue. Bar 3 formed a two-bar reversal at the session high, thus a reliable short scalp. It was followed by a swing down, forming three EMA gap bars. Bar 4 was a big strong bull trend bar, and although its total size was less than 75% of the previous bar’s size (which is usually required for a two-bar reversal), it had very small shadows and comparable body height. It warranted a fairly reliable scalp up. Bar 5 formed a double-top bear flag, and therefore a short scalp, down to bar 6, which was a double-bottom bull flag. Bar 7 marked the formation of an inside-inside-inside pattern, suggesting a reversal after the recent rally and a short entry below the low of the pattern (the big bull trend bar). Traders entered on a limit order below its low, as evident by the huge, almost double-shaved, bear trend bar. Bar 8 formed a double-top bear flag. therefore suggesting a short entry beneath its low. The move down extended to bar 9, which itself developed a double-bottom with the trading range’s lowest point, ensuring a significant rebound, if that support level does not get broken. There was a protracted move up to bar 10 with several scalp opportunities, and more experienced traders would even swing a portion of their position. Bar 10 formed another double top, suggesting a short entry below its low.